My favorite food of all time is salmon. Like, if I were stranded on an island and could eat one food and one food only, that would be it. Henceforth, my first official blog post features this ambrosia of the sea. Salmon recipes are plentiful, but this one is my favorite. My godsend of a mother has been making this dish for as long as I can remember. She may also be at fault for my pension for salmon, due to that fact that it was the only food she craved during her pregnancy with me (this theory also explains my sister’s affinity for french fries). It’s also.. lucky for you and me… SUPER CHEAP AND SIMPLE. I always get a larger piece of salmon than necessary for next-day leftovers. 1) In a small mixing bowl, add equal parts Mayo and Dijon mustard (I used 3 tbsps each) and a bunch of chopped dill (I used ¼ cup). You can play around with the amounts- the bigger the fish the more you use. The mix I made was enough to thoroughly coat about a pound of salmon. 2) Mix well, and then liberally (i.e. smother) your salmon. 3) Stick in the fridge for at least 2 hours, but no more than 12. This allows the mix to get real friendly with the salmon filet, which is exactly what you want. 4) Preheat oven to 400 degrees. 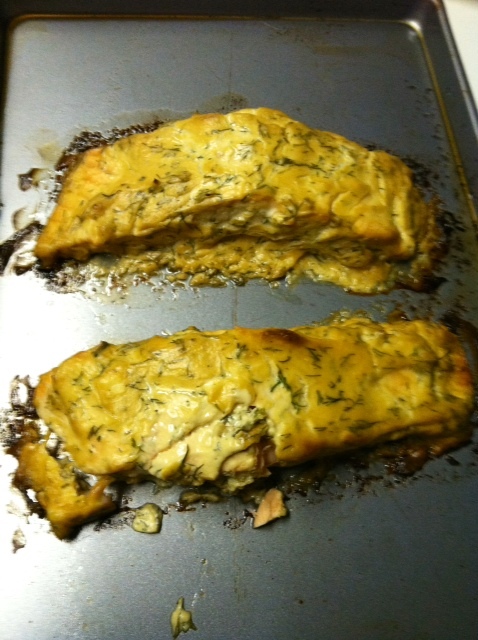 When oven is ready, bake salmon for 20 minutes. I would check at the 15 minute mark to make sure you’re on target. Cook until deliciously pink and can be easily cut with a fork. 5) ENJOY! I recommend accompanying your amazing creation with baked asparagus, sauteed mushrooms, and a robust red wine (I prefer a bottle of Fourteen Hands Red Blend, approx $13).